Last month's post, March 1968 'On the Cover', was the start of the fifth year of the ongoing series. That makes this current post the 50th to feature covers from the top two American chess magazines of 50 years ago. 'The World Correspondence Chess Champion' by Hans Berliner, World Correspondence Champion  On January 31, 1968 play in the [5th] Individual World Correspondence Chess Championship officially came to an end. After almost three years of combat, 17 competitors from nine different countries ceased play in the round-robin contest, and the ten games still remaining unfinished were submitted for adjudication. I have a page showing a crosstable of the event: World Chess Championship : 5th ICCF Correspondence Finals. Berliner scored +12-0=4 to finish three points ahead of the runner-up. When Berliner died in January last year, I took a snapshot of his Chess Hall of Fame entry in Hans Berliner (1929-2017). The one page Chess Life (CL) article by Berliner quoted above was followed by the first of a short series of CL articles titled 'The Lure of Correspondence Chess' by Hans Berliner. That first article featured the game Yakov Estrin vs Hans Berliner; 5th CC World Ch Final 1965 (chessgames.com), one of the best known games in correspondence chess. The Brooklyn Museum and the Metropolitan Museum of Art are collaborating in displaying one of the most important collections of chessmen and boards in existence. "Chess: East and West, Past and Present" will be on view at the Brooklyn Museum, April 2 to October 1. The sets have been loaned to the Brooklyn Museum by the Metropolitan Museum of Art, mostly from the Gustavus A. Pfeiffer Collection. New Yorker Pfeiffer was a devoted collector of chessmen, keenly interested in the game, its meaning and history. 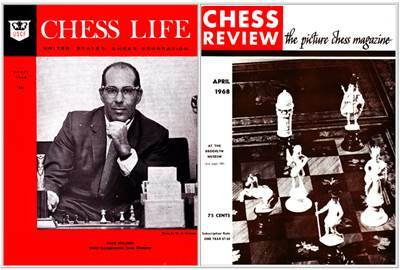 This marked the second consecutive month that Chess Review featured a chess set on its cover. For more about the Pfeiffer collection, see Chess: East and West, Past and Present. A Selection from the Gustavus A. Pfeiffer Collection (metmuseum.org).